Ann, this is WONDERFUL!!! And I can only imagine how fun it must be to do these window designs. I love your castles so much! Amazing!! What happens to the castle afterwards? Please tell me you don’t throw it away! That is AMAZING! I would love to peak inside that. I can feel the excitement that kids would have! Oh Ann! This is truly wonderful! I love that you have ‘peek’ holes with images inside!!! Love the mushrooms and wire bats too! that has to be at least 8 different kinds of awesome. 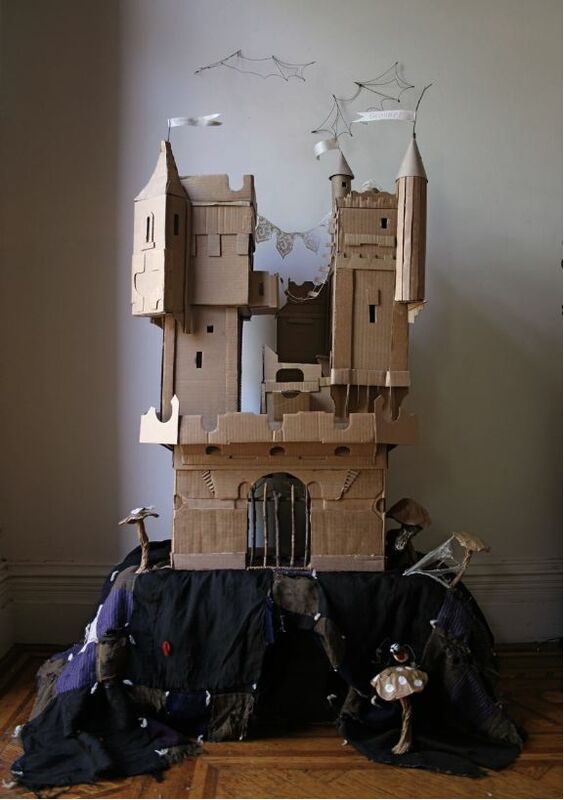 I love cardboard, and castles, and the little peepholes are pure genius. that castle is fantastic, really great. Woaaahh that’s amazing! Would you mind if I write about this on my blog? I really love it. This is just breathtaking. I love it! I would want it to stay at my house forever 🙂 That must has been so much fun to work on….I love beautiful window displays but this takes the cake, just wondering! How enchanting! What a wonderful project to do with a child…esp. in the cooler weather! Just incredible! Thank you for the inspiration! This is so utterly magical …..
Sooo creative. So amazing!! What a great project!! Very impressive !! Bravo. I love the fact that you can reproduce nearly everything out of cardboard. can i come over and play?! Fabulous castle. It’s an absolute enchantment… astonishing ! Ann, how talented you are! I found your site by fluke; I’m enchanted with the cardboard castle and your absolutely adorable birds, so I’ve bookmarked you. I had the chance to visit NYC for the first time this summer, and I fell in love with it. i totally like your castle . it is amazing and awesome. AMAZING castle. I would love to learn how to do this…you should make a tutorial. I’m featuring this on my blog and pointing at you!! Dear Ann, your cardboard castle caught my eye thanks to bookhoucraftprojects where I saw it first, months ago from today. It’s such a wonderful project for kids and grownups together. I’d like to make a link to your blog on BlogDay2009, and that is tomorrow! ???????????? ?????! ??????????? ????????? ??????? ????? ? ?????? ?? ?????? ???????????????? ???????? ?.